Homemade dog treats don't have to cost a fortune to be healthy and taste great. The average cost of homemade dog treats directly relates to the type of treat you’re looking to make. Some treats cost just a few dollars, while others feature high-quality ingredients and cost a lot more money. In general, homemade dog treats do cost less than their store-bought counterparts, so they’re worth the investment. On average, the ingredients in homemade dog treats cost around $10, but a low-dollar recipe will only cost around $5. It has two ingredients, and neither one should cost more than $2. All you need is baby food and flour. It’s recommended to use 100 percent organic whole wheat flour. You can choose almost any baby food, including beef, sweet potato, chicken and more. Just don’t pick a flavor with onions in it, nor choose a baby food that includes artificial ingredients. Mix 2 cups of flour with 2 jars of pureed baby food to form dough. Roll out the dough and use a pizza slicer or cookie cutters to cut out the treats. Bake them in your oven at 350 degrees, on a cookie sheet lined with parchment paper, for around 25 minutes. 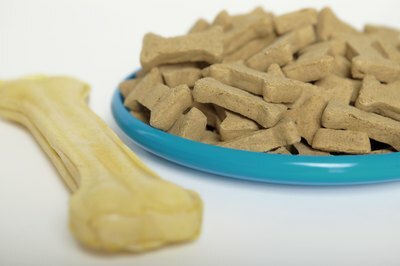 The Animal Planet website lists banana bites as an inexpensive homemade treat that dogs and dog owners can enjoy together. Most of the ingredients for banana bites you’ll already have on hand, but even if you have to purchase everything new, it won’t cost you more than $15, and you’ll have enough to make this treat again. Animal Planet promotes its Pea-Nutty Nibbles recipe as an inexpensive, healthy treat made of easy-to-find and on-hand ingredients like oatmeal, peanut butter and cinnamon. Moderately priced homemade dog treats are going to require a personal investment of $15 to $25. These treats feature ingredients that are more sophisticated but also healthier for your pooch. Animal Planet recommends its Buckwheat Bone Biscuits as a treat your dog can chew on. The treats aren’t difficult to make but require special ingredients like buckwheat flour, ground beef and rolled oats. Martha Stewart suggests making some tasty homemade dog biscuits as a way to treat your dog for good behavior. This moderately priced treat is easy to make, but you’ll need to make room in the cupboard for wheat germ, brewer’s yeast and low-sodium canned chicken stock. The most expensive homemade dog treats you could make, really, have no cap. Expensive homemade treats may cost $25 or $250. Even so, they can be less expensive than store-bought treats with similar ingredients. If you want your dog to have delicious gourmet treats, you’ll want to include high-end ingredients, like filet mignon and pan-seared duck. These recipes may be expensive and complicated to make, but your dog will revel in their deliciousness. Curbly: How to Make Your Own Dog Treats!